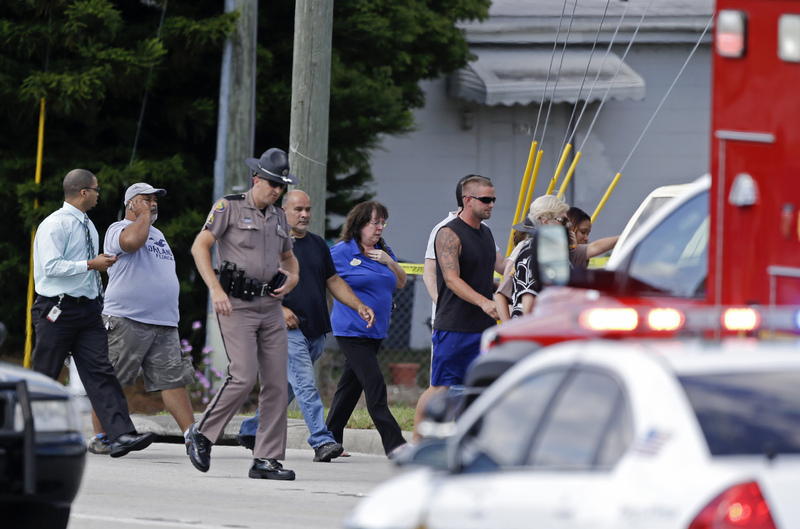 WINTER PARK, Fla. - A car that had been forced off the road by another vehicle cashed into a day care center Wednesday afternoon, killing one child and injuring several others, officials said. The driver who sparked the chain-reaction crash fled the scene. Police were looking for a 28-year-old man they described as a "person of interest" in the case, CBS affiliate WKMG in Orlando reported. The crash occurred around 3:05 p.m. at the KinderCare Learning Center on Goldenrod Road in Winter Park, an Orlando suburb. Orange County Fire Rescue said the crash occurred when an SUV ran another vehicle off the road, causing that other car to crash into the day care center. Fifteen people were hurt, 11 of them children, authorities said. Two people were treated on scene and 13 were taken to area hospitals, according to Orange County Fire Rescue. One of the injured children died Wednesday evening at Arnold Palmer Hospital, hospital officials told WKMG. Orange County Mayor Teresa Jacobs called the crash "an absolute tragedy and disaster." The driver who triggered the crash fled the scene, and police launched a search for the vehicle. A few hours later, the Florida Highway Patrol found a Silver Dodge Durango they believe to be the vehicle involved in the crash. Authorities said they were looking for a person of interest in the crash whom they identified as 28-year-old Robert Corchado. The Florida Highway Patrol said described Corchado as "dangerous" and said he had been spotted at Orlando International Airport, where he rented a Mazda CX-1 SUV. WKMG said records show Corchado was arrested in 2013 on charges of careless driving, hit and-run and leaving the scene of property damage. He is currently awaiting trial on those charges. Orange County Fire Rescue said 50 children were inside of the day care at the time of the crash, and all children are accounted for. The day care was evacuated after the crash and part of Goldenrod Road was shut down, WKMG said. Witness Jeezy Jenkins told WKMG he was repairing the roof of a gas station next to the day care when he heard the sound of screeching tires. He said he looked up and saw the crash, and a silver Dodge Durango speeding off. Jenkins said he ran to try to help. Inside the day care, he said he saw small children, seriously injured, lying on the ground. "There was other ones that weren't moving at all, and the teachers were giving them CPR and stuff like that," he said.